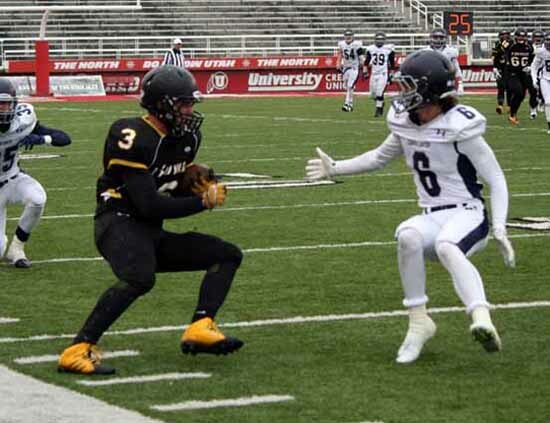 The vote for the Preps Utah player of the week for Week 8 of the 2014-2015 school year turned into a tight two-way battle between a player who led his team into the Class 4A state championship game last week and another who set the pace as his team won the 3A title. In the end, the voters sided with Roy two-way star Cody Hobbs as our weekly top athlete. With nearly 1,500 votes recorded, Hobbs finished on top with 40 percent, while Judge Memorial’s Max Barnett ended up in second position at 32 percent. Bingham’s back-up quarterback, Ben Boelter, who came up huge in the Miners’ state semifinal win, received 20 percent of the votes, as Timpview’s Jordan Espinoza and Dixie’s Trenton Miller split the remaining tally. Voting for the Preps Utah player of the week takes place online at PrepsUtah.com, where Hobbs was our winner for the week of November 17. Hobbs is a receiver and linebacker for the Royals, who led his team into the 4A state title game after a long dry spell. 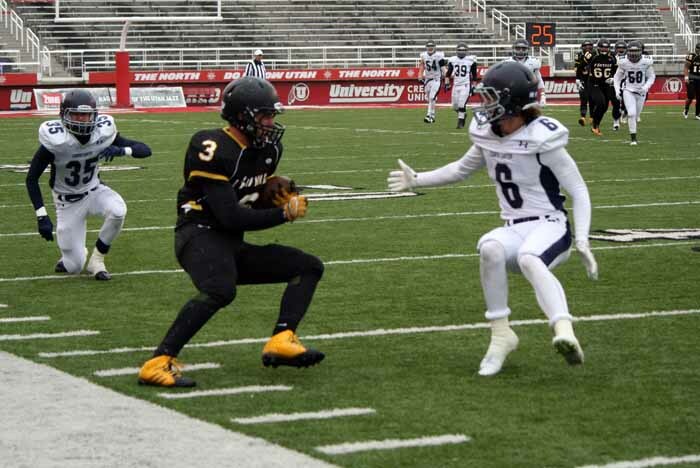 He caught five passes for 181 yards in the team’s semifinal win over Corner Canyon, including a 72-yard touchdown catch. The senior also had a big day on the defensive side, with six tackles and one critical sack. He will receive a Preps Utah Athlete of the Week t-shirt and be entered into the pool for a school year-end drawing for a possible scholarship. Week 9 gives Preps Utah readers the chance to log on and celebrate the state championship game performances of five more football players. This group will be available for your votes for two weeks as the Thanksgiving holiday comes upon us: Cameron Smith from Bingham, Timpview’s Will Watanabe, Charlie Sefita from Hurricane, Nathan Honey of American Fork and Dixie’s Ammon Takau.